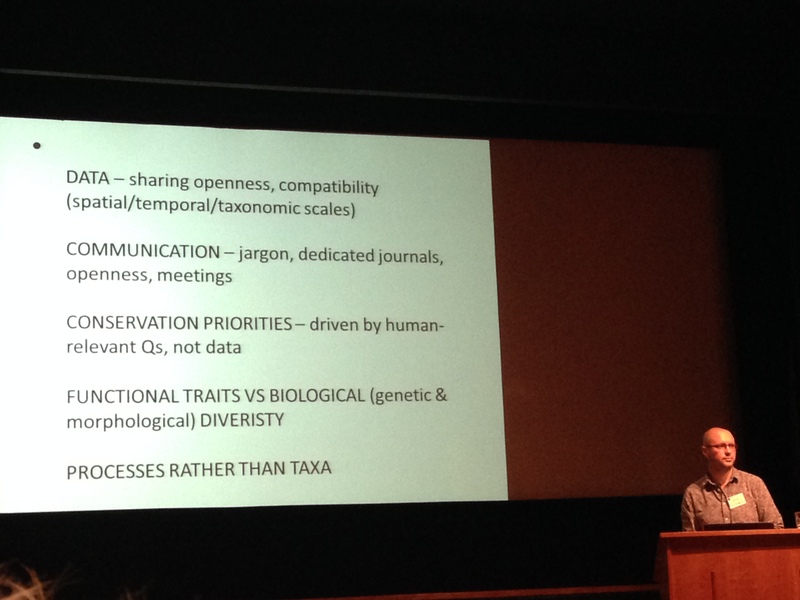 On 1st April, Alice, Encarni, Hayley and Nick attended the joint British Ecological Society Macroecology Special Interest Group and Palaeontological Association workshop held in the Natural History Museum, called Challenges in Macroecology – Scaling the Time Barrier. The workshop was co-organised by our member Phil Jardine (jointly with Victoria Herridge, Adriana de Palma and Isabel Fenton), and it was a mix between deep and shallow time, neoecologists and other researchers interested in any kind of macroecology topics. We enjoyed so much how this one-day meeting was scheduled, with some formal approach including four plenary and lighting talks, and other informal initiatives such as speed dating and discussion groups. This way, all participants could interact with other non-directly related researchers. Andy Purvis opened the session with the definition of macroecology, the trends and shifts of study topics it has carried out since the discipline began and ended with what macroecology is not any longer. David Jablonski explored through examples of bivalves studies how climate in time and space affects the studies of diversity dynamics, mainly addressed to three key questions: a) Extinctions, b) Latitudinal Diversity Gradients, and c) Geographical ranges. Lee Hsiang Liow encouraged us to evaluate both processes and observations, and highlighted the importance of modelling both to take into account the “unobservable” or latent truth including examples of capture-recapture and occupancy methods. Kathy Willis gave a review of the trends followed for conservation strategies since 1980s, until the development of the “ecosystems services” idea of given an economic value to biodiversity. Her main statement was focused on how palaeo-data can help in providing information to some “knowledge gaps” related to human resources including: a) trends in biomass, b) trends in nutrient cycling, c) trends in in final ecosystems services, and d) sustainability of ecosystems services. Lighting talks were related to more specific study cases of macroecology, including specific researches about turtles, fungi, beetles, crocodiles, foraminifera or dinosaurs, in several spatial and temporal scales . We would like to thank again Phil, Victoria, Adriana and Isabel for the great day that finished with a nice and warm wine reception sponsored by BMC Ecology. We hope to attend further events like this soon. For more on this meeting see blog post by @protohedgehog “Macroecology – scaling the time barrier” and storify of the twitter feed, click here.